Kagan Online Magazine - Where in the World Is Kagan? 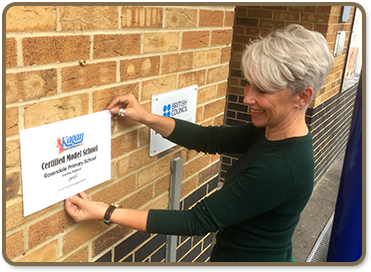 Rosendale is proud to be a Kagan UK Cooperative Learning Model School. The following is an article by Kate Atkins, headteacher Rosendale Primary School, Dulwich, London and Gavin Clowes, Director KaganUK. Kagan Structures encourage every child to be actively engaged in the learning process. Through the use of Kagan Structures, students are taught how to learn cooperatively with their peers, while simultaneously required to have individual accountability for their own learning. As a direct result of infusing Kagan Cooperative Learning into our students’ daily learning experiences, their social skills and character virtues improve, thus decreasing discipline issues school-wide. With behavior distractions kept to a minimum, our teachers are able to focus more time on instruction and learning, which positively impacts our students yearly academic achievement. 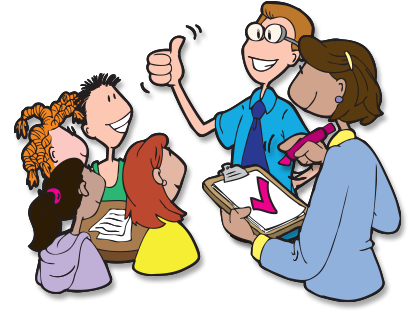 All teachers at Rosendale are required to receive extensive and ongoing Kagan Cooperative Learning training throughout their years of teaching at our school. Kate Atkins talks to Gavin Clowes from Kagan UK about how mixed attainment teaching and the use of cooperative and coaching structures supports brain-friendly teaching. Click to listen on SoundCloud. There were several drivers for the decision to implement Kagan Cooperative Learning at Rosendale Primary School. Closing the attainment gap between pupil premium and non-pupil premium children was one of them, but as important was the school's growing understanding of evidenced practice and the need to question traditional teaching methods and styles. The Teaching and Learning Toolkit compiled by the Education Endowment Foundation has synthesised many research studies and highlighted that collaborative learning, metacognitive strategies, feedback, and oral language interventions all had a high impact on children’s learning. Research had also indicated that children explaining learning to other children was extremely effective in deepening the understanding of more able pupils, and as a result, many schools, including Rosendale, used “talk partners” to try to achieve this. Looking closely at the reality of talk partners revealed that there was not equal participation and that the children who needed to talk and practice were the very children who were silent. So the question that we faced was “How can we implement peer tutoring and classroom discussion in a way that makes an impact on children’s achievement?” Our starting point to answer that question was, how are other schools doing it? We visited other schools across the country to look at what was working well and what would suit Rosendale’s context and found it in a school in the North West of England that had introduced Kagan Cooperative Learning (a system of pedagogy which promotes cooperation and communication in the classroom). It was love at first sight! Our plan was to implement Kagan Cooperative Learning as a way of teaching across the school during the academic year. Once we made this decision, we contacted a consultant (the wonderful Gavin Clowes of Kagan UK - T2T UK) to look at the training we could provide. We set aside two INSET days to have Days 1 and 2 of the 4-day Kagan Training program delivered to all staff. At the end of Day 1, we agreed on a set of targets that all teachers would achieve and the time scale for completing them. For example, we agreed that all children in KS2 would sit in mixed ability teams of four from the start of the term and by the end of the first training day, all the teachers had put their children into heterogeneous teams. There were other targets agreed upon around implementation as well, and the senior team took responsibility for making sure those targets were met and provided the support needed. Over the course of this academic year, we continued to train staff with lots of in class support, including in-class coaching from the Kagan trainer who ensured fidelity and consistency by running twilight sessions to address common issues and also by “fixing” classroom practice during the coaching sessions. He also gave lots of feedback to the senior team, highlighting staff who needed more support and suggestions on how to help them and staff that would be good mentors for others. The choice to use Kagan Cooperative Learning as opposed to any other form of mixed attainment teaching was influenced by its focus on whole school ethos as well as giving staff a structured format to follow. We realized that this fundamental change to our pedagogy would take time to implement, two or three years, and would need lots of support and training. We were in this for the long term and so decided to send two of our own staff to become Kagan trainers so that they could provide regular support. For example, every month they ran an Adult Learning Session focussing on getting one particular structure right, looking at how to match content to structure, and addressing issues that had come up as a result of classroom monitoring. We also deepened our understanding of the philosophy of cooperative learning. We also made sure that we practiced what we preached. All our Adult Learning Sessions use Kagan Cooperative Learning structures and we sit in mixed teams, not with our friends, so that all the staff get to work together and know each other. We use simple structures in assemblies, and when we observed lessons at the beginning, we looked for the use of Kagan Cooperative Learning and made sure that all our feedback focused on that. We have never taken our eye off the ball, and we have been relentless in insisting on this pedagogy—even six years on we still have monthly training sessions and we evaluate our training needs regularly. We are honored to have become a Kagan Model School and hope that we can support more schools on their journey to becoming truly cooperative.